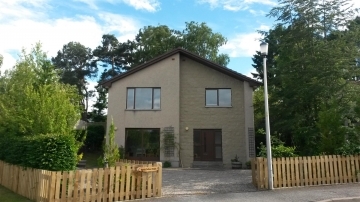 Self-catering holiday accommodation, sleeps 8, in Boat of Garten, near Aviemore in the Cairngorms National Park, in the Scottish Highlands. This is a modern, spacious, comfortable and child-friendly 4 bedroom house with enclosed garden which is equally suited to families or groups. It is arranged over two floors with the upper level having lovely views from the main lounge and direct access to the secluded rear garden from the kitchen / dining area. Centrally located in the "Osprey Village", it is a short walk to many excellent local amenities and attractions. These include two well-stocked shops, one a Post Office, the Boat Inn and restaurant, Andersons restaurant, a church, the Strathspey Steam Railway, the River Spey, the acclaimed Boat of Garten Golf Club, tennis courts and Milton Loch with its bird-watching hide. Only 5 miles from Aviemore the house is ideally located to explore this beautiful part of the Scottish Highlands.